A beautiful place unseen by many,which is just 70 km away from Bangalore towards kolar. Nature was at its best with Hairpin bends, away from city life, sunrise between the hills. There are few buses which commute from kolar, Locally its cald teerahalli betta. Before reaching kolar city take a left under flyover near anthargange main road. Travel for 15km you will find a beautiful place cald teerahalli hills. There are many private and government property , please be careful before you go for off roading near kallu mantapa. Eatables available near dargah and in village. Breakfast available near flyover.Early morning suitable for ride. Places nearby : Anthrgange , Kotilingeshwara , KGF. Devarayanadurga is a hill which is situated in Tumkur and has two popular temples, the Yoganarasimha and Bhoganarasimha and is a popular destination. The place is a favorite with both pilgrims as well as mountain climbers. The hills with lush green trees on all sides make the climbing a lot enjoyable. The place was originally known as Anebiddasari then as Jadakana Durga after a chief named Jadaka and finally as Devarayanadurga after its capture by Mysore king Chikka Devaraja Wodeyar. On the hilltop are perched two popular Devarayanadurga Temples, the Yoganarasimha and the Bhoganarasimha Temples. These temples are visited by pilgrims all through the year. 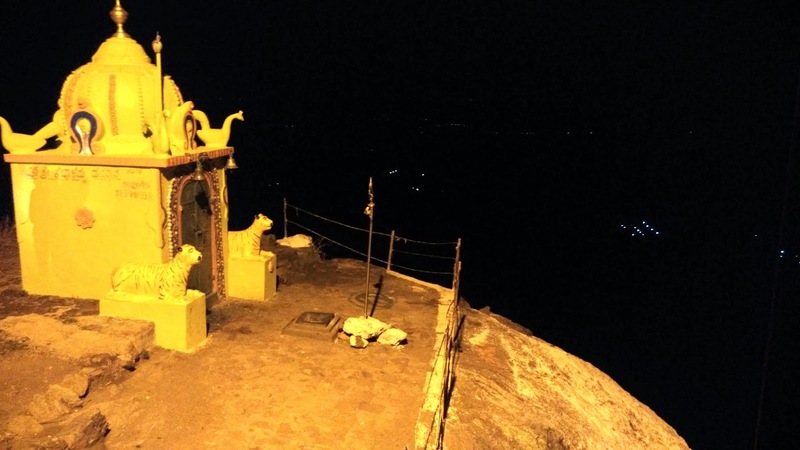 The Bhoganarasimha is at the base of the hill while the Yoga Narasimha is perched at the top of the hill. Devarayanadurga located 65 kilometers from Bangalore. The nearest railway station is at Tumkur and the area also has excellent bus connections. Bangalore --- Yeshwanthpur --- Dobbespet -> Right turn under the flyover leads to Devarayandurga. Nearest Places: Siddaganga mutt, Siddara Betta, Mandargiri hills, Nijagal Betta. Food Available near both temples. En route to Devarayana durga is a place located called Namada Chilume( the Spring of Tilaka/Nama) at the base of the hill road leading to Tumkur. Tilaka or Nama or Pundraka is a ritual mark on the forehead, of sandalwood paste, coloured earth or vermilion. Based on the Puranas it is believed that Sri Rama during Vanavas(exhile to forest) on his way to Lanka halted here. He wanted to apply Nama or Tilaka on his forehead, not finding water anywhere around to wet the “nAma, he shot an arrow into the ground, and a spring sprang and thus the name (Rama)-nAmada chilume. The spring can be still seen, the water comes out from a small hole throughout the year and never dries up. There is a Deer Park in the vicinity of the Namada Chilume,There many spotted deer taken care by the forest department. One can enjoy the un-polluted greenery and fresh air of the Namada Chilume. It is good try for one day trip. One needs to carry their own water and food, though there are small shops around.